Organize your info & create mind maps. Is there a better alternative to NoteMind? Is NoteMind really the best app in Personal Info Managers category? Will NoteMind work good on macOS 10.13.4? NoteMind helps you to collect and to organize informations centrally in one single place. It learns the way you organize your documents, and automatically tries to find a matching folder for new informations. You will be able to display your collected documents as a mind map, and modify them in any way you like. NoteMind needs a rating. Be the first to rate this app and get the discussion started! Your personal database NoteMind enables you to manage many kinds of information, may it be a search result for a special subject, or even your shopping list. For whatever kind of information, NoteMind will help you to manage and to archive it in a neat and easy way. You can paste text documents, pictures, PDF's or Web links, and store them everlasting in your NoteMind-Database, where you always have them ready to hand. Mind Maps NoteMind automatically creates mind maps of your folder tree within the program. This will give you the best overview of all your collected documents. Mind maps can be edited within an external layout software, and comments and annotations can be added. Collecting informations NoteMind assists you in compiling informations. Did you find a relevant text section in the internet, or another application? Simply mark it and hit Cmd-* (use Shift, if you have a notebook keyboard). NoteMind automatically copies the selection into it's database. If you wish, NoteMind even tries to find the best matching folder for the selected text. This function is available after the machine has been restarted, because Mac OS X needs to update the service menu. Always ready to hand Drag a NoteMind window to any border of your display. It will transform into a docked window, which automatically minimizes, if NoteMind is no longer in the foreground. This will help you to keep your notes and To-Do-Lists in reach, without wasting desktop space. Latest technology NoteMind uses Apple CoreData to store your informations. All data, including pictures and Web links are stored within a single file, that can be exchanged with other users. 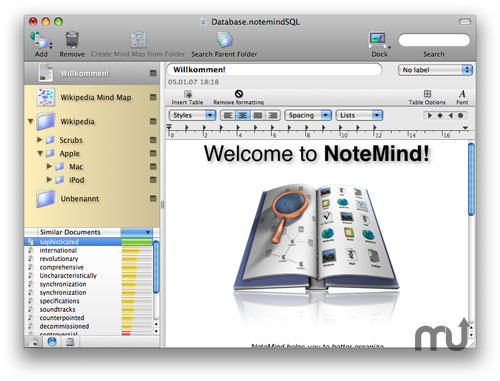 Moreover, NoteMind makes use of Mac OS X 10.4 Spotlight, to find documents with similar content on your hard drive. Similarity check While you work in NoteMind, all your documents will be indexed in background. This enables NoteMind to find similar content within NoteMind itself, on your hard drive, or even online in the world wide web. The search for similar content will be displayed in the main window, and therefore is always in your focus.